Richard Samuel Attenborough, Baron Attenborough, CBE (/ˈætənbʌrə/; 29 August 1923 – 24 August 2014) was an English actor, film director, film producer, entrepreneur, and politician. He was the President of the Royal Academy of Dramatic Art (RADA) and the British Academy of Film and Television Arts (BAFTA). As a film director and producer, Attenborough won two Academy Awards for Gandhi in 1983. He also won four BAFTA Awards and four Golden Globe Awards. As an actor, he is perhaps best known for his roles in Brighton Rock, The Great Escape, 10 Rillington Place, Miracle on 34th Street (1994), and Jurassic Park. Attenborough was born on 29 August 1923 in Cambridge, the eldest of three sons of Mary Attenborough (née Clegg), a founding member of the Marriage Guidance Council, and Frederick Levi Attenborough, a scholar and academic administrator who was a fellow at Emmanuel College, Cambridge, and wrote a standard text on Anglo-Saxon law. Attenborough was educated at Wyggeston Grammar School for Boys in Leicester and studied at RADA. In September 1939, through the British charitable programme known as Kindertransport, the Attenboroughs took in two German Jewish refugee girls, Helga and Irene Bejach (aged 9 and 11 respectively), who lived with them in College House and were adopted by the family after the war when it was discovered that their parents had been killed. The sisters moved to America in the 1950s and lived with an uncle, where they married and took American citizenship; Irene died in 1992 and Helga in 2005. During the Second World War, Attenborough served in the Royal Air Force. After initial pilot training he was seconded to the newly formed R.A.F. Film Unit at Pinewood Studios, under the command of Flight Lieutenant John Boulting (whose brother Peter Cotes would later direct Attenborough in the play The Mousetrap) where he appeared with Edward G. Robinson in the propaganda film Journey Together (1943). He then volunteered to fly with the Film Unit and after further training, where he sustained permanent ear damage, qualified as a sergeant, flying on several missions over Europe filming from the rear gunner's position to record the outcome of Bomber Command sorties. Attenborough's acting career started on stage and he appeared in shows at Leicester's Little Theatre, Dover Street, prior to his going to RADA, where he remained Patron until his death. Attenborough's film career began in 1942 in an uncredited role as a sailor deserting his post under fire in the Noël Coward/David Lean production In Which We Serve (his name and character were accidentally omitted from the original release-print credits), a role which would help to type-cast him for many years as a spiv or coward in films like London Belongs to Me (1948), Morning Departure (1950) and his breakthrough role as Pinkie Brown in John Boulting's film adaptation of Graham Greene's novel Brighton Rock (1947), a part that he had previously played to great acclaim at the Garrick Theatre in 1942. In 1949, exhibitors voted him the sixth most popular British actor at the box office. Attenborough worked prolifically in British films for the next 30 years, including in the 1950s, appearing in several successful comedies for John and Roy Boulting, such as Private's Progress (1956) and I'm All Right Jack (1959). In 1963, he appeared alongside Steve McQueen and James Garner in The Great Escape as RAF Squadron Leader Roger Bartlett ("Big X"), the head of the escape committee, based on the real-life exploits of Roger Bushell. It was his first appearance in a major Hollywood film blockbuster and his most successful film thus far. During the 1960s, he expanded his range of character roles in films such as Séance on a Wet Afternoon (1964) and Guns at Batasi (1964), for which he won the BAFTA Award for Best Actor for his portrayal of the Regimental Sergeant Major (RSM). In 1965 he played Lew Moran opposite James Stewart in The Flight of the Phoenix and in 1967 and 1968, he won back-to-back Golden Globe Awards in the category of for Best Supporting Actor – Motion Picture, the first time for The Sand Pebbles, again co-starring Steve McQueen, and the second time for Doctor Dolittle starring Rex Harrison. His portrayal of the serial killer John Christie in 10 Rillington Place (1971) garnered excellent reviews. In 1977, he played the ruthless General Outram, again to great acclaim, in the Indian director Satyajit Ray's period piece The Chess Players. He took no acting roles following his appearance in Otto Preminger's version of The Human Factor (1979) until his appearance as John Hammond in Steven Spielberg's Jurassic Park (1993) and the film's sequel, The Lost World: Jurassic Park (1997). He starred in the remake of Miracle on 34th Street (1994) as Kris Kringle. Later he made occasional appearances in supporting roles, including as Sir William Cecil in the historical drama Elizabeth (1998), Jacob in Joseph and the Amazing Technicolor Dreamcoat and as "The Narrator" in the film adaptation of Spike Milligan's comedy book Puckoon (2002). He made his only appearance in a film adaptation of Shakespeare when he played the English ambassador who announces that Rosencrantz and Guildenstern are dead at the end of Kenneth Branagh's Hamlet (1996). In the late 1950s, Attenborough formed a production company, Beaver Films, with Bryan Forbes and began to build a profile as a producer on projects including The League of Gentlemen (1959), The Angry Silence (1960) and Whistle Down the Wind (1961), appearing in the cast of the first two films. His feature film directorial debut was the all-star screen version of the hit musical Oh! What a Lovely War (1969), after which his acting appearances became sporadic as he concentrated more on directing and producing. He later directed two epic period films: Young Winston (1972), based on the early life of Winston Churchill, and A Bridge Too Far (1977), an all-star account of Operation Market Garden in World War II. He won the 1982 Academy Award for Best Director and as the film's producer, the Academy Award for Best Picture for his historical epic Gandhi and another two Golden Globes, this time for for Best Director and for Best Foreign Language Film, for the same film in 1983, a project he had been attempting to get made for 18 years. Attenborough also directed the screen version of the musical A Chorus Line (1985) and the anti-apartheid drama Cry Freedom (1987), based on the life and death of prominent anti-apartheid activist Steve Biko and the experiences of Donald Woods. He was nominated for a Golden Globe Award for Best Director for both films. His later films as director and producer include Chaplin (1992) starring Robert Downey, Jr., as Charlie Chaplin and Shadowlands (1993), based on the relationship between C. S. Lewis and Joy Gresham (the star of the latter was Anthony Hopkins, who had appeared in four previous films for Attenborough: Young Winston, A Bridge Too Far, Magic and Chaplin). Between 2006-07, he spent time in Belfast, working on his last film as director and producer, Closing the Ring, a love story set in Belfast during the Second World War and starring Shirley MacLaine, Christopher Plummer and Pete Postlethwaite. After 33 years of dedicated service as President of the Muscular Dystrophy campaign, Attenborough became the charity's Honorary Life President in 2004. In 2012, the charity, which leads the fight against muscle-wasting conditions in the UK, established the Richard Attenborough Fellowship Fund to honour his lifelong commitment to the charity, and to ensure the future of clinical research and training at leading UK neuromuscular centres. Attenborough was also the patron of the United World Colleges movement, whereby he contributed to the colleges that are part of the organisation. He was a frequent visitor to the Waterford Kamhlaba United World College of Southern Africa (UWCSA). With his wife, they founded the Richard and Sheila Attenborough Visual Arts Centre. He also founded the Jane Holland Creative Centre for Learning at Waterford Kamhlaba in Swaziland in memory of his daughter who died in the tsunami on 26 December 2004. He was a longtime advocate of education that does not judge upon colour, race, creed or religion. His attachment to Waterford was his passion for non-racial education, which were the grounds on which Waterford Kamhlaba was founded. Waterford was one of his inspirations for directing the film Cry Freedom, based on the life of Steve Biko. He was elected to the post of Chancellor of the University of Sussex on 20 March 1998, replacing The Duke of Richmond and Gordon. He stood down as Chancellor of the university following graduation in July 2008. There now hangs a 42 inch by 46 inch portrait of him in the university's library. A lifelong supporter of Chelsea, Attenborough served as a director of the club from 1969–1982 and between 1993 and 2008 held the honorary position of Life Vice President. On 30 November 2008 he was honoured with the title of Life President at the club's stadium, Stamford Bridge. He was also head of the consortium Dragon International Film Studios, which was constructing a film and television studio complex in Llanilid, Wales, nicknamed "Valleywood". In March 2008, the project was placed into administration with debts of £15 million and the site is believed to be being considered for breaking-up with a sale of the assets. He had a lifelong ambition to make a film about his hero the political theorist and revolutionary Thomas Paine, whom he called "one of the finest men that ever lived". He said in an interview in 2006 that "I could understand him. He wrote in simple English. I found all his aspirations – the rights of women, the health service, universal education... Everything you can think of that we want is in Rights of Man or The Age of Reason or Common Sense." He could never secure the funding to do so. The website "A Gift for Dickie" was launched by two filmmakers from Luton in June 2008 with the aim of raising £40m in 400 days to help him make the film, but the target was not met and the money that had been raised was refunded. Attenborough's father was the principal of University College, Leicester, now the city's university. This resulted in a long association with the university, with Attenborough becoming a patron. The university's Embrace Arts at the RA centre, which opened in 1997 is named in his honour. He had two younger brothers: naturalist and broadcaster David; and John (died 2012), who had made a career in the motor trade. Attenborough married actress Sheila Sim in 1945. From 1949 until October 2012 they lived in Beaver Lodge on Richmond Green in London. Owing to the couple's deteriorating health, the house was sold in October 2012 for £11.5 million. In the 1940s, he was asked to 'improve his physical condition' for his role as Pinkie in Brighton Rock. He was asked to train with Chelsea Football Club for a fortnight, subsequently becoming good friends with those at the club. He went on to become a director during the 1970s, helping to prevent the club losing its home ground by holding onto his club shares. In 2008, Attenborough was appointed Life President of Chelsea Football Club. On 26 December 2004 the couple's elder daughter, 49-year-old Jane Holland, along with her mother-in-law, also Jane McKern (widow of Leo McKern), and Attenborough's 15-year-old granddaughter, Lucy, were killed when a tsunami caused by the Indian Ocean earthquake struck Khao Lak, Thailand, where they were on holiday. A service was held on 8 March 2005 and Attenborough read a lesson at the national memorial service on 11 May 2005. His grandson Samuel Holland, an actor in his own right, who survived the tsunami uninjured, and granddaughter Alice Holland, who suffered severe leg injuries, also read in the service. A commemorative plaque was placed in the floor of St. Mary Magdalen's parish church in Richmond. Attenborough later described the Boxing Day of 2004 as "the worst day of my life". Attenborough had two other children, Michael and Charlotte. Michael is a theatre director and the former artistic director of the Almeida Theatre in London and has been married to actress Karen Lewis since 1984; they have two sons. Charlotte is an actress, and has three children. He publicly endorsed the Labour Party in the 2005 General Election, despite his opposition to the Iraq War. Attenborough collected Picasso ceramics from the 1950s. More than 100 items went on display at the New Walk Museum and Art Gallery in Leicester in 2007, in an exhibition dedicated to family members lost in the tsunami. In 2008 he published an informal autobiography entitled Entirely Up to You, Darling in association with his long-standing friend and colleague Diana Hawkins. In August 2008, Attenborough entered hospital with heart problems and was fitted with a pacemaker. In December 2008, he suffered a fall at his home after a stroke, and was admitted to St George's Hospital in Tooting, southwest London. In November 2009 Attenborough, in what he called a "house clearance" sale, sold part of his extensive art collection, which included works by L. S. Lowry, Christopher R. W. Nevinson and Graham Sutherland, generating £4.6 million at Sotheby's. In January 2011, he sold his Rhubodach estate on the Scottish Isle of Bute for £1.48 million. In May 2011, David Attenborough revealed that his brother had been confined to a wheelchair since his stroke in 2008, but was still capable of holding a conversation. He added that "he won't be making any more films." In June 2012, shortly before her 90th birthday, Sheila Sim entered the actors' home Denville Hall, for which she and Attenborough had helped raise funds. In July 2012 it was announced that Sim had been diagnosed with senile dementia. In October 2012, it was announced that Attenborough was putting the family home, Old Friars, with its attached offices, Beaver Lodge, which come complete with a sound-proofed cinema in the garden, on the market for £11.5 million. His brother David stated: "He and his wife both loved the house, but they now need full-time care". It simply isn’t practical to keep the house on any more." In March 2013, in light of his deteriorating health, Attenborough moved into a nursing home in London to be with his wife, as confirmed by their son Michael. Attenborough died on 24 August 2014, five days before his 91st birthday. He was survived by his wife of almost 70 years, their two surviving children, six surviving grandchildren and a great-grandchild. Attenborough was the subject of This Is Your Life in December 1962 when he was surprised by Eamonn Andrews at the Savoy Hotel, during a dinner held to commemorate the 10th anniversary of the Agatha Christie play The Mousetrap, in which he had been an original cast member. In the 1967 Birthday Honours, he was appointed a Commander of the Order of the British Empire (CBE). He was made a Knight Bachelor in the 1976 New Year Honours, having the honour conferred on 10 February 1976 and on 30 July 1993 he was created a life peer as Baron Attenborough, of Richmond upon Thames in the London Borough of Richmond upon Thames. Although the appointment by John Major was 'non-political' (it was granted for services to the cinema) and he could have been a crossbencher, Attenborough chose to take the Labour whip and so sat on the Labour benches. In 1992 he had been offered a peerage by Neil Kinnock, then leader of the Labour Party, but refused it as he felt unable to commit to the time necessary "to do what was required of him in the Upper Chamber, as he always put film-making first". In 1983, Attenborough was awarded the Padma Bhushan, India's third highest civilian award, and the Martin Luther King, Jr. Nonviolence Peace Prize by the Martin Luther King, Jr. Center for Nonviolent Social Change. In 1992 he was awarded the Shakespeare Prize for his life's work by the Alfred Toepfer Foundation in Hamburg. In 1993, Attenborough was appointed a Fellow of King's College London. On 13 July 2006, Attenborough, along with his brother David, were awarded the titles of Distinguished Honorary Fellows of the University of Leicester "in recognition of a record of continuing distinguished service to the university". On 20 November 2008, Attenborough was awarded an Honorary Doctorate of Drama from the Royal Scottish Academy of Music and Drama (RSAMD) in Glasgow. Attenborough was an Honorary Fellow of Bangor University for his contributions to film making. Pinewood Studios paid tribute to his body of work by naming a purpose-built film and television stage after him. The Richard Attenborough Stage has an area of 30,000 sq ft. In his absence because of illness, Lord Puttnam and Pinewood Chairman Lord Grade officially unveiled the stage on 23 April 2012. Attenborough also headed a committee awarding the eponymous Attenborough Prize, a £2,000 annual arts prize celebrating creativity by emerging artists. 1963 The Great Escape Yes Sqn. Ldr. Roger Bartlett "Big X"
In early 1973 he was spoofed as "Dickie Attenborough" in the British Showbiz Awards sketch late in the third series of Monty Python's Flying Circus. Attenborough is portrayed by Eric Idle as effusive and simpering. In 2012 Attenborough was portrayed by Simon Callow in the BBC Four biopic The Best Possible Taste about Kenny Everett. ↑ "Encyclopaedia Britannica". Britannica.com. 9 November 2013. http://www.britannica.com/EBchecked/topic/1398450/Richard-Attenborough. Retrieved 24 August 2014. ↑ "Richard Attenborough profile at". Filmreference.com. http://www.filmreference.com/film/38/Richard-Attenborough.html. Retrieved 5 June 2011. ↑ "Richard Attenborough Biography". Movies.yahoo.com. https://uk.movies.yahoo.com/person/richard-attenborough/biography.html. Retrieved 8 May 2014. ↑ "Sir Richard Attenborough remembers Kindertransport". Daily Mail. London. http://www.dailymail.co.uk/femail/article-1166729/Sir-Richard-Attenborough-remembers-Kindertransport.html. Retrieved 15 October 2014. ↑ "Bob Hope Takes Lead from Bing In Popularity.". ACT: National Library of Australia. 31 December 1949. p. 2. http://nla.gov.au/nla.news-article2759831. Retrieved 27 April 2012. ↑ Flynn, Bob (2 August 2002). "Arts: Filming Spike Milligan's Puckoon". The Guardian. London, UK. http://www.guardian.co.uk/film/2002/jul/23/artsfeatures. ↑ "Richard Attenborough Fellowship Fund". Muscular-dystrophy.org. http://www.muscular-dystrophy.org/waystodonate/fund_a_scientist/richard_attenborough_fellowship_fund. Retrieved 24 August 2014. ↑ Gurner, Richard. "Lord Attenborough steps down as Sussex University chancellor". The Argus. Brighton. http://www.theargus.co.uk/search/2235631.Lord_Attenborough_steps_down_as_Sussex_University_chancellor_/. Retrieved 5 June 2011. ↑ "Bulletin – 31 October 2008". Sussex.ac.uk. 31 October 2008. http://www.sussex.ac.uk/press_office/bulletin/31oct08/article13.shtml. Retrieved 5 June 2011. ↑ "Valleywood film studios faces possible sell-off". BBC News. 3 March 2011. http://www.bbc.co.uk/news/uk-wales-south-east-wales-12632138. ↑ Hattenstone, Simon (6 September 2008). "Richard Attenborough on laughter, levity and the loss of his daughter". The Guardian. London. http://www.theguardian.com/lifeandstyle/2008/sep/06/tsunami2004.worldcinema. Retrieved 24 August 2014. ↑ Ann Talbot (18 September 2009). "A New World: A Life of Thomas Paine by Trevor Griffiths". World Socialist Website. http://www.wsws.org/en/articles/2009/09/pain-s18.html. Retrieved 24 August 2014. ↑ Peter T. Chattaway (11 June 2008). "Flashback: Sir Richard Attenborough, the Grey Owl interview". Patheos. http://www.patheos.com/blogs/filmchat/2008/06/flashback-sir-richard-attenborough-the-grey-owl-interview.html. Retrieved 24 August 2014. ↑ "Reformer may be captured on film". BBC News. 23 September 2003. http://news.bbc.co.uk/1/hi/england/norfolk/3133896.stm. Retrieved 24 August 2014. ↑ "Dickie Attenborough gets help from Luton film makers". Bedford Today. 10 June 2008. http://www.bedfordtoday.co.uk/news/local/dickie-attenborough-gets-help-from-luton-film-makers-1-1029819. Retrieved 24 August 2014. ↑ "A Gift for Dickie". Directors Notes. 5 May 2008. http://www.directorsnotes.com/2008/05/05/a-gift-for-dickie/. Retrieved 24 August 2014. ↑ "index — University of Leicester". Embracearts.co.uk. http://www.embracearts.co.uk. Retrieved 24 August 2014. ↑ 24.0 24.1 "Lord Attenborough's family rally round as Sheila Sim is hit by illness". London. 27 July 2012. http://www.telegraph.co.uk/news/celebritynews/9430222/Lord-Attenboroughs-family-rally-round-as-Sheila-Sim-is-hit-by-illness.html. ↑ Pook, Sally (8 December 2005). "Attenborough family's fatal tsunami decision". London. http://www.telegraph.co.uk/news/uknews/1504959/Attenborough-familys-fatal-tsunami-decision.html. Retrieved 5 June 2011. ↑ Hurst, Greg. "Richard Attenborough's Picasso ceramics". Times Online. London. http://entertainment.timesonline.co.uk/tol/arts_and_entertainment/visual_arts/article1808736.ece. Retrieved 3 September 2011. ↑ 30.0 30.1 30.2 Hall, Melanie (26 March 2013). "Film director Richard Attenborough moved to care home". London. http://www.telegraph.co.uk/news/celebritynews/9954199/Film-director-Richard-Attenborough-moved-to-care-home.html. Retrieved 21 April 2013. ↑ Adams, Stephen (11 November 2009). "Lord Attenborough's picture sale makes £4.6m at Sotheby's". London. http://www.telegraph.co.uk/culture/art/art-news/6546233/Lord-Attenboroughs-picture-sale-makes-4.6m-at-Sothebys.html. ↑ Johnson, Simon (23 January 2011). "Richard Attenborough seeks compensation after he is forced to sell Scottish estate at knock-down price". London. http://www.telegraph.co.uk/news/uknews/8276933/Richard-Attenborough-seeks-compensation-after-he-is-forced-to-sell-Scottish-estate-at-knock-down-price.html. Retrieved 25 August 2014. ↑ Walker, Tim (12 May 2011). "Lord Attenborough takes a final bow". London. http://www.telegraph.co.uk/news/celebritynews/8507673/Lord-Attenborough-takes-a-final-bow.html. Retrieved 5 June 2011. ↑ "Lord Richard Attenborough's Wife Suffering From Dementia". Contactmusic.com. 27 July 2012. http://www.contactmusic.com/news/lord-richard-attenboroughs-wife-suffering-from-dementia_1375135. Retrieved 24 August 2014. ↑ Walker, Tim. "Lord Attenborough gives up an £11.5 million love affair", The Daily Telegraph (London), 29 October 2012. Retrieved on 29 October 2012. ↑ "Actor Richard Attenborough dies at 90". BBC News. 24 August 2014. http://www.bbc.co.uk/news/entertainment-arts-28923074. Retrieved 24 August 2014. ↑ Johnston, Chris (24 August 2014). "Richard Attenborough dies aged 90". The Guardian. London. http://www.theguardian.com/film/2014/aug/24/richard-attenborough-died-aged-90. Retrieved 24 August 2014. ↑ "Richard Attenborough quotes: From how ET 'should have won the Oscar' to coping with grief". The Independent. http://www.independent.co.uk/news/people/news/richard-attenborough-quotes-from-how-et-should-have-won-the-oscar-to-coping-with-grief-9689308.html. Retrieved 25 January 2015. ↑ The London Gazette: (Supplement) no. 44326. p. 6278. 10 June 1967. ↑ The London Gazette: (Supplement) no. 46777. p. 1. 1 January 1976. ↑ The London Gazette: no. 46828. p. 2435. 17 February 1976. ↑ "Burke's Peerage – Preview Family Record". Burkes-peerage.net. Archived from the original on 11 August 2011. https://web.archive.org/web/20110811022430/http://www.burkespeerage.com/familyhomepage.aspx?FID=0&FN=ATTENBOROUGH. Retrieved 5 June 2011. ↑ The London Gazette: no. 53397. p. 13291. 10 August 1993. Retrieved 24 August 2014. ↑ "Padma Awards". Ministry of Home Affairs, Government of India. 2015. http://mha.nic.in/sites/upload_files/mha/files/LST-PDAWD-2013.pdf. Retrieved July 21, 2015. ↑ "Commemorative Services: Martin Luther King Jr.". Thekingcenter.org. http://www.thekingcenter.org/the-king-holiday/commemorative-service. Retrieved 3 September 2011. ↑ "Honorary Degrees and Distinguished Honorary Fellowships Announced by University of Leicester". www2.le.ac.uk. 9 June 2006. http://www2.le.ac.uk/ebulletin/news/press-releases/2000-2009/2006/06/nparticle.2006-06-09.8313843344. Retrieved 5 June 2011. ↑ "News from India". Indiaenews.com. 16 December 2009. http://indiaenews.com/2006-06/10872-leicester-varsity-honour-attenborough-brothers.htm. Retrieved 5 June 2011. ↑ "Actors honoured by arts academy". BBC News. 5 November 2008. http://news.bbc.co.uk/1/hi/scotland/glasgow_and_west/7710935.stm. Retrieved 8 May 2014. ↑ "Lord Attenborough, Honorary Fellow, Bangor University". Bangor.ac.uk. http://www.bangor.ac.uk/about/alumni/Lord_Attenborough.php.en. Retrieved 5 June 2011. ↑ "The Richard Attenborough Stage opens for business at Pinewood Studios". pinewoodgroup.com. 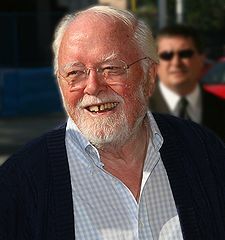 23 April 2012. http://www.pinewoodgroup.com/our-studios/uk/news/richard-attenborough-stage-opens-business-pinewood-studios. Retrieved 23 April 2012. Wikimedia Commons has media related to Category:Richard Attenborough. "Richard Attenborough". Find a Grave. http://www.findagrave.com/memorial/134814909. Retrieved 2015-07-21.